When you’re looking for a practical floortype, vinyl is your answer. It is strong, hypoallergenic, slip resistant, heat conductive and very easy to clean. 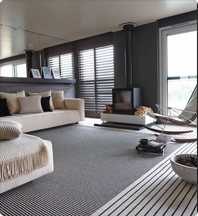 At Carpetright we offer an amazing variety of colours, design, thicknesses and slip resistance levels. A perfect match for every room in your house! Visit our stores for inspiration. Maybe you prefer the natural look of a wood design or a modern stripe design? Or perhaps our futuristic metallics or a simple, clean tile design for a more traditional look? Most of our stores have a large selection available to buy and take away. Ask one of our trained advisors about our takeaway service. When looking for good quality vinyl, your first step is Carpetright. The Prestige range looks and feels so realistic that you'll actually forget it's vinyl. A contemporary looking range at an affordable price, that is the Flair range. A thick surface and long durability make the Goliath a giant among vinyl. Perfect for busy family life. Great value vinyl in classic designs that will suit any home is available in store to take away. This easy to clean floor and has a 5 year wear warranty that gives extra peace of mind to those looking for kitchen vinyl flooring and bathroom vinyl flooring. Our Planet range is a hard wearing and extremely resilient vinyl flooring. Perfect for both residential and commercial use, Planet comes in a wide range of colours to suit any area. Ideal for high traffic areas, offices with castor chairs or simply just for use in your kitchen at home.